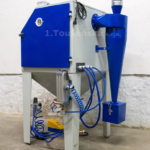 Cyclone Separator – 1.Toušeňská s.r.o. This supplementary equipment is inserted in between the cabinet and the dust collector. It increases exhaustion efficiency and simultaneously collects coarse abrasives (larger grains). This function can be used especially with finer materials where it is possible to recycle the fraction back to the cycle.